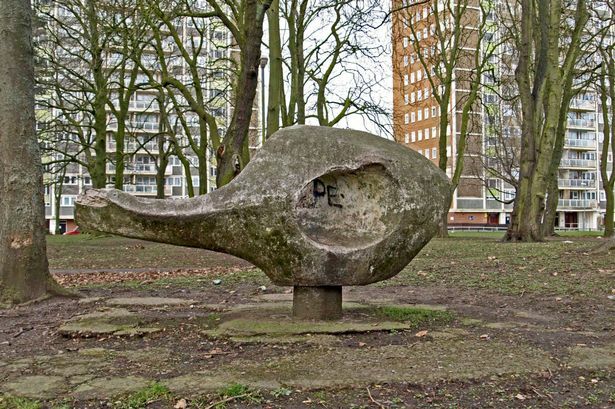 The fish sculpture in Acocks Green, Birmingham, created by John Bridgeman in 1960, is given protected status. It’s Birmingham’s most unusual playground – and now this wacky fish sculpture has been saved for generations of children. Dating from 1960, the Grade II-listed landmark in Curtis Gardens, Acocks Green, is the only surviving play sculpture created for the city by artist John Bridgeman. Part of a post-Second World War drive to make artwork more accessible to children, Bridgeman said in a 1961 article that sculpture appeared to youngsters a “remote, ‘arty’ grown-up aberration associated with vast, resounding, slippery-floored museums, usually roped off from young, meddling fingers, or at best intimidatingly labelled ‘Do not Touch’”. The work, listed in February, has now been named by the Historic England group among the highlights of the 510 items and locations nationwide given protected status over the past year. Others include a lamp that burned gas from Victorian sewers in Sheffield, the Lancashire gravestone of the leader of the band that played as the Titanic sank and a pebble pavement in Lytham. Heritage Minister Tracey Crouch said: “By protecting our national heritage through listing we leave a vital legacy for generations now and in the future. From an ancient henge in Yorkshire to bus stations in Berkshire , it’s great to see we have protected such a rich variety of heritage sites this year. He said the National Heritage List was “not just the official database for England’s most important sites and structures: it is a celebration of our special places and ensures that England’s history is recognised, respected and enjoyed ”. Writing about the fish design online, Acocks Green History Society said: “Play sculptures were an unusual and innovative idea. “It appears that Acocks Green’s fish is the only one still in situ, which influenced English Heritage in its wish to have it listed. The hole in the sculpture is certainly reminiscent of Henry Moore.